It’s not very often that I go out for dinner without J and L, but I was hungry and they weren’t, so I waited until they went to bed before tracking down some food. 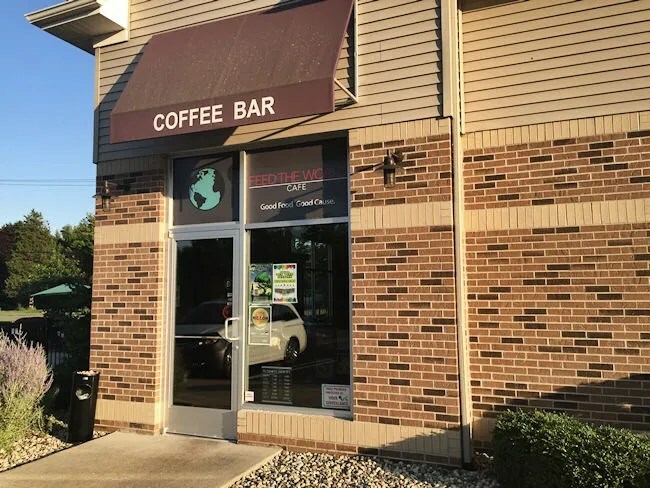 A couple of months ago, J told me about a new restaurant that took over the space formerly occupied by Blackeye Espresso Cafe in the Village Place development on the west side of Oshtemo Township. The restaurant takes up a corner space of the development off Stadium Drive near 8th Street. I was only in Blackeye Espresso once for a quick lunch, but it doesn’t look like they’ve changed much. The restaurant still has the feel of a coffee shop from the large work area for the coffee and breakfast part of the business to the fireplace and comfy chairs that make up part of the dining room. I walked in at about 7:30 on a Friday night. There were a couple of other groups dining on the patio, but I was the only one inside the building in the more traditional part of the dining room. A waitress followed me over with both a beer list and a menu. While the space still feels like a coffee house, it borders on an upscale restaurant with a good selection of craft beers and wines. Plus, they have a menu that’s very not coffee house like. I decided before I walked in the door I was going to do a burger and a beer. The beer I chose was Space Rock by Short’s Brewing. 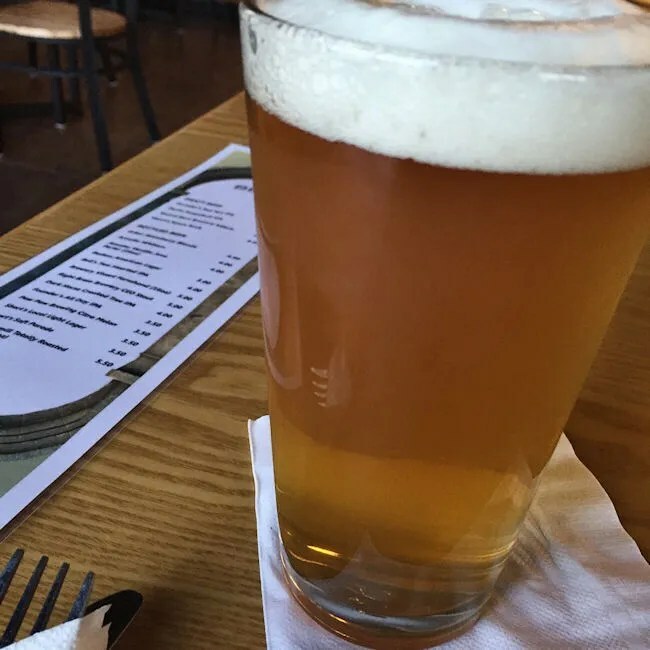 It’s one of their many pale ales…this one’s an American Pale Ale (APA). It’s good, but nothing outstanding. I enjoyed it very much, but it’s not one of those beers that I will remember next year when it comes out. Once that waitress brought the beer, I put in my order for a Steak Burger. 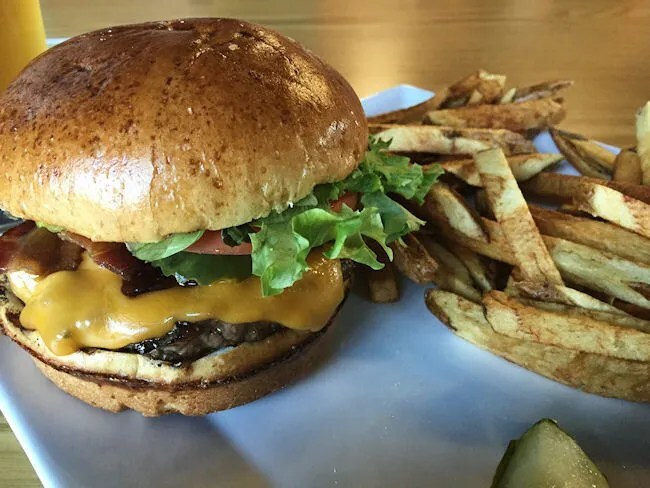 The meat is a blend of locally raised beef. It’s served on a flaky, toasted bun that comes with lettuce, tomato, and pickle. I added on cheddar cheese, bacon, and BBQ sauce. The sandwich was very tasty. Using fresh meat makes the burger taste so much better than the places that tend to use frozen patties. The bun was soft and flaky, but held up to the juicy burger and the sweet, tangy BBQ sauce that I had added to the sandwich. The burger came with fresh cut fries and these fries were good enough to be an entree on their own. They were the really delicious, slightly greasy fries that are crunch and salty on the outside, but still soft and chewy on the inside. The burger was delicious, but I would have been just as happy with a humongous portion of fries for dinner. My bill was a little over $15 for the sandwich and the beer and I was able to get in and out in about twenty minutes. Feed The World Cafe is in a challenging spot on the edge of town and kind of hidden in plain site. Behind the drab exterior of a somewhat out of place, generic strip mall, they have an amazing selection of delicious, locally sourced, home made food. 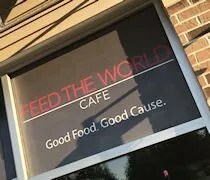 There’s also the added benefit of the charity work…the name Feed The World Cafe is also a hint to what they do behind the scenes. Every meal bough the store provides a meal to one of three Kalamazoo area shelters.